Hey you, Apple user. Have you been waiting—and waiting and waiting—for Apple to make some face-melting upgrades to the MacBook instead of just bumping the specs every few months? Well, this is it. Maybe. With a capital "M."
Those crazy Cupertino kids were just granted a patent for a touch-friendly, solar-powered laptop from the future. 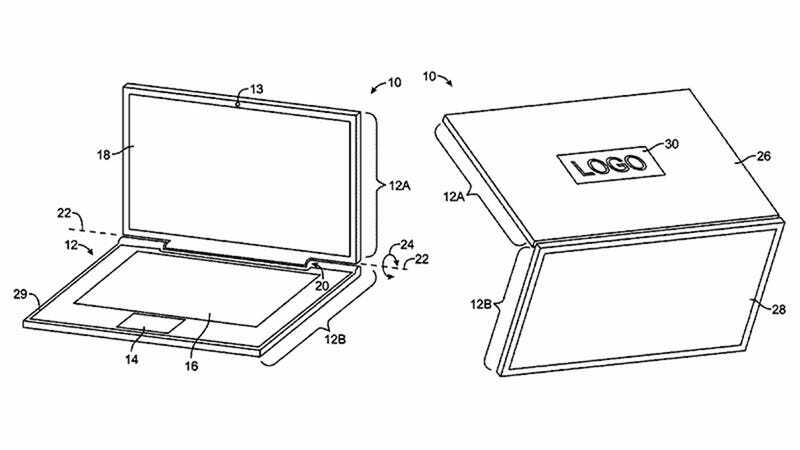 As the (very boring) illustration included in the patent application dug up by Apple Insider makes clear, it just looks like a regular laptop—but it's got some pretty bombastic features. The back of the display, for instance, is actually a rear-facing second display covered in electrochromic glass and solar cells. You can make the glass opaque or clear with the tap of a key, and it uses ambient light to recharge itself. It will also be touch-sensitive, just like an iPad. On top of that, it's also radio transparent basically enabling the whole thing to become one big WiFi antenna. Now that's what I call a MacBook Pro! Except it's not real. Nope. Not even close. Because the patent exists, we can assume that Apple's built a prototype—but don't expect this thing to show up in a keynote any time soon. In fact, some 0f the features detailed in the patent are so outlandish that it's hard to imagine Apple would ever even consider bringing them to market. "Rear-facing display covered in electrochromic glass?" That sounds cool with all the words and whatnot, but seriously, what the hell would you use it for? The one thing about this unicorn of a MacBook design that does seem tangible is the solar-powered detail. Apple has actually been awarded five different patents for solar-power-related products, including one for an "integrated touch sensor and solar assembly" for the iPhone. That technology includes integrating solar cells into the touchscreen using electrodes that both soak up ambient light and respond to touch.